Zofia Walczak reviews the documentary, Notes on a Political Journey , made by the filmmaker, Leila Doolan, about the political life of Bernadette Devlin MacAliskey. Seamus Heaney, the celebrated Irish poet, died earlier this year on August 30th. He was a frequent visitor to Scotland and friend of Sorley Maclean and Norman MacCaig. He wrote the acclaimed translation from the Early Anglo-Saxon of the founding epic poem of England, Beowulf . Heaney was a great Irish internationalist. Mary McGregor has written the following appreciation of his life. Heaney was a poet of international acclaim. His skill and ability to convey emotions in words and images is exceptional. He was part of the land and appreciated its importance in shaping its sons and daughters. For him the Irish landscape was the repository of Irish history and yet he rejected the worlds of his father and “his father before him” in favour of writing poetry. This invariably placed him as an outsider in terms of his own family and traditions. On November 30th a wide range of socialists and others will be coming together in London to found a Left Unity Party. None of the early proposed platforms, including that of the main organisers, has anything to say about the real nature of the UK state or the current political situation in Scotland. Now, however, some members of the Republican Socialist Alliance are putting forward an alternative platform which addresses these issues. 1. The global financial and economic crisis since 2008 has been transformed by governments bailing out the banks while imposing austerity policies on the poor. This has resulted in a massive redistribution of income and wealth from working people to the rich and powerful. The RCN has been campaigning for socialists in Scotland to organise on the basis of ‘internationalism from below’ since we were founded. We persuaded the Scottish Socialist Party to organise a successful Republican Socialist Convention in Edinburgh, and have participated in two events in England. Steve Freeman organised these two meetings in London, and is a speaker in today’s RIC workshop on ‘The Break-up of the UK’. Here is the outline of his contribution. In January 1649 the Commonwealth of England was established. In March parliament abolished the monarchy and the House of Lords, as ‘useless’ and ‘dangerous’. But the Commonwealth did not become a democratic and social republic. It was strangled at birth. The origins of the Commonwealth can be traced back to 1638 and the rebellion of the Covenanters in Scotland. What began in Scotland as the ‘Bishops War’ soon spread to England. In 1644 a united front of Covenanters and Cromwell’s holy squadrons, the Ironsides, defeated the Royalists at the battle of Marston Moor near York. It proved to be the turning point in the revolution. In 1645 the New Model Army was established. By 1648 it had become England’s republican army which took power in 1649 as the Commonwealth. Shortly afterwards, Cromwell’s counter-revolution gathered pace. The Levellers and the Diggers were suppressed. Jim Slaven of the James Connolly Society explains why socialists and antimilitarists do not wear red poppies on November 11th, especially as the British ruling class is getting ready to launch its centenary of the First World War. This celebration of the UK and British Empire is part of their campaign against Scottish self-determination. I won’t be wearing a poppy this year. Of course this revelation is some considerable way short of a shock. However as we are entering that time of year it is worth being clear about why we do not wear a poppy. Republicans do not support the British military and despite all the myth-making wearing a poppy is all about supporting the British military. It’s not about World War One and it’s not about remembering the dead. It is all about supporting the UK state’s war machine. Despite the near compulsion which accompanies poppy wearing in public life there are actually many very good reasons not to wear one. But after recent events in Scotland we also have another reason. The decision of Police Scotland, the Procurator Fiscal and the military hierarchy to do nothing over the racist and sectarian hate-fest at the Ibrox ‘Armed Forces Day’ has convinced even more people that there is something seriously wrong with this country. Through social media the shocking scenes of hundreds of state forces joining in with thousands of football fans in singing sectarian and racist songs was shared throughout the world. Despite this the country’s politicians remain silent and no action has been taken. We are being encouraged to move along quietly. Alicia Arquera gave this introduction to a discussion on Women and Independence at the Edinburgh branch of the Radical Independence Campaign on April 29th. I just wanted to start by saying how pleased I am to have been asked to speak this evening on women and independence. I’ve been involved in the Radical Independence Campaign since the conference of last year, and during that time I’ve felt slightly disheartened by the lack of discussion of issues that face women and the role of women in the campaign. Little discussion has been had on what a radical vision for Scotland could do for women’s liberation. But hopefully this evening we will outline some of the issues that need to be considered when thinking of a progressive Scotland. Scottish Self-Determination: For A Wannabe Ruling Class or for Scotland’s People? The SNP is conducting its campaign for a ‘Yes’ vote around a series of proposals that fall considerably short of genuine self-determination and amount to ‘Independence-Lite’ for a wannabe Scottish ruling class. Here, the RCN is putting forward some alternative proposals, which would open the way to meaningful self-determination for the people and working class of Scotland. These proposals are not designed to be exhaustive. We welcome other suggestions from RIC supporters. It is a full year since the launch of the Radical Independence Campaign (RIC) last November in Glasgow. This was the largest gathering of the Left seen in Scotland for many a year. Since then the campaign has taken off, with local branches established throughout Scotland. RIC members have been involved in a wide range of campaigns. These have included protests again the ‘bedroom tax’; the weekend of action against Faslane nuclear submarine base; directly challenging Nigel Farage on his ‘visit’ to Edinburgh pushing UKIP’s uberreactionary agenda; opposition to former Greek premier Papandreou’s invitation to the TEDGlobal conference in Edinburgh; and supporting campaigns of solidarity with Palestine. There was also a sizeable RIC contingent on the Scottish independence march in Edinburgh on September 11th. 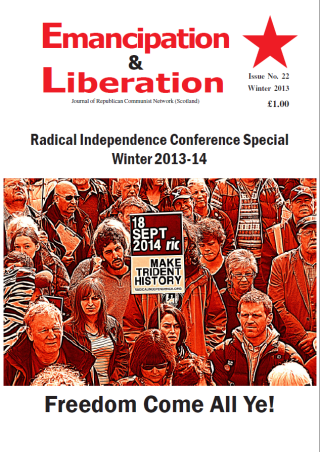 Issue 22 of Emancipation & Liberation is out now. If you would like to buy this issue or subscribe, contact us. Comments are open, so until articles are online, feel free to discuss the articles below. When they are online you can discuss the article in it’s comment section.